Questacon: Self-guided tour through the National Science and Technology Centre. Cockington Green Gardens: Self-guided around the world tour in miniature. AIS Australian Institute of Sport: Athlete guided 90 minute tour of the home of sport. On your next visit to Canberra, open the doors to Canberra's three top attractions with on great ticket! 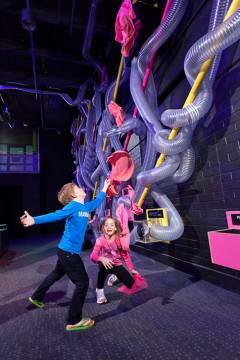 With your 3-in-Fun ticket, you can explore the wonderful world of science at Questacon - the National Science and Technology Centre. Then, step into a world of all things miniature as you travel around the world at Cockington Green Gardens. Finally, discover the champion within at the Australian Institute of Sport with an athlete-guided tour. On your next visit to Canberra, open the doors to Canberra's three top attractions with one great ticket! With a 3 in Fun ticket, you can explore the wonderful world of science at Questacon - the National Science and Technology Centre. Then, step into a world of all things miniature as you travel around the world at Cockington Green Gardens. Finally, discover the champion within at the Australian Institute of Sport with an athlete-guided tour. And, because once is never enough, you'll receive a return visit to the attraction of your choice. - Family price is valid for 2 adults and 2 children 4-16 years inclusive. - Present this voucher at the first attractions you visit to receive your 3 in Fun Ticket. - The visitor will be required to present photo identification at the attractions gate. Ticket holders who cannot provide sufficient identification may be denied entry. - Valid for 6 months from date of service. - 3 in Fun Tickets (Full or Partial) are not transferable, refundable or redeemable for cash. - Australian Institute of Sport tour times - 10am, 11:30am, 1pm and 2:30pm. - After all three attractions have been visited, one free return visit is offered to one attraction of your choice. - Valid for 12 months from date of ticket purchase. Ticket is not transferrable.